A sneak peak at my latest acquisition which arrived today. I knew right away what it was based on the size of the package ^^; Konata is FREEing’s first figure in their 1/4 scale Lucky Star set and was released last week. 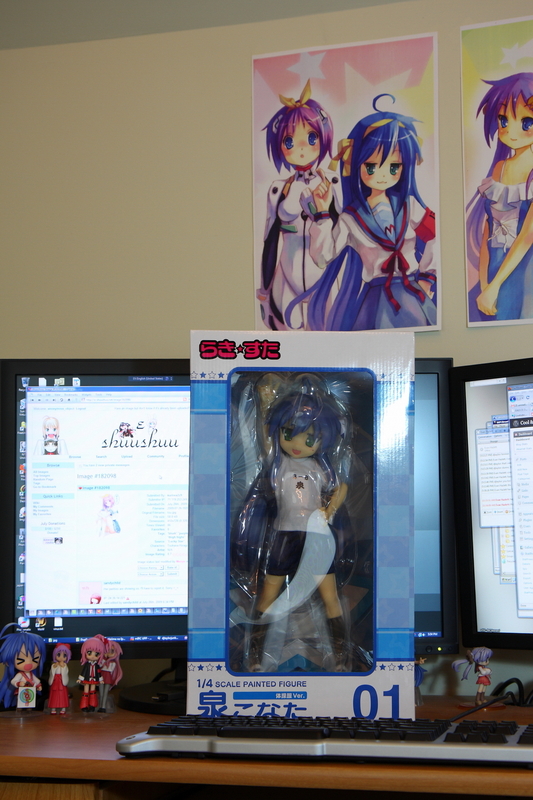 I know it’s 1/4 scale and is supposed to be big but I’m amazed by the size of this figure >_< The above picture shows Konata against my monitor. That’s a 26″ monitor and it really shows the sheer size of Konata ^^. Also, the gym uniform is nice. Real fabric! Will u be collecting the whole set? I think 1/6 is as far as I will go. .-= Optic´s last blog ..Featured blog of the Week on AnimeBlips =-. Good for you. I’d going down that path soon, I think. .-= Seinime´s last blog ..Blade is a lolicon and a siscon. Plus the girls from the Needless ED are finally in. =-. .-= Evangeline Mcdowell´s last blog ..Image: 2009-07-28-182611.jpeg =-. @Seinime: Hope you do. My initial impressions of Konata are good. I will post more about her in my full review. Just hope you have deep pockets >_< @Eva: As Fuka would say, "でか!" That Konata is huge! This is madness! Her height will pierce the heavens! She looks great but that 1/4 scale is just too big for me, much like GSC’s Nanoha and Fate in 1/4, nice but a bit too large for me. .-= Smithy´s last blog ..New K-ON! Album Cover Art? =-. .-= Leonia´s last blog ..Juillet 2009 =-. wow amazing i need one!! 1/4 are always fun ^^ grats on the get and looking forward to the review! .-= meronpan´s last blog ..ぐーぱん！ ~ Gu-pan! and Figure Talk =-.